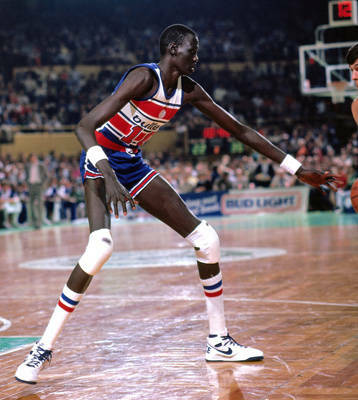 The 76ers have announced their intentions to sign the corpse of Manute Bol to a 5-year contract, dependent on his ability to claw himself out of his coffin before the All-Star break. Age – 47 at time of death. Pros – Has NBA ready experience, but hasn’t stepped on a court or terra firma for more than five years. Still possesses fabulous length, but limbs and height may have atrophied since he left this plane of wordly existence. Yet to be seen if he’ll take on the characteristics of the undead from a George Romero movie or 28 Weeks Later … could be a major advantage for team if he commits to a 28 Weeks Later role, as speed and agility would certainly increase. Can still knock down the occasion three-point shot from beyond the grave. He cannot be worse than Samuel Dalembert, who is still in the NBA. Cons – Teammates could possibly be distracted by stench. Will not stop talking about brains and a desire to consume them. May be too amazed by his resurrection to fully commit to basketball duties on and off the court. Fingernails and hair continued to grow after death, so a trim and a shave is a necessity. Outlook – Despite his death, Bol still possess Grade-A height and could serve as a mentor for Nerlens Noel, as he did for Shawn Bradley back in 1994. It remains to be seen how rising from the grave will effect his defense, but it should not be an issue. He needs to improve scoring and suppress his desire to shamble into the crowd and feast on delicious brains of the fans. However, desire to eat brains could work itself into a favorable team contract, as brains do not count against the salary cap.